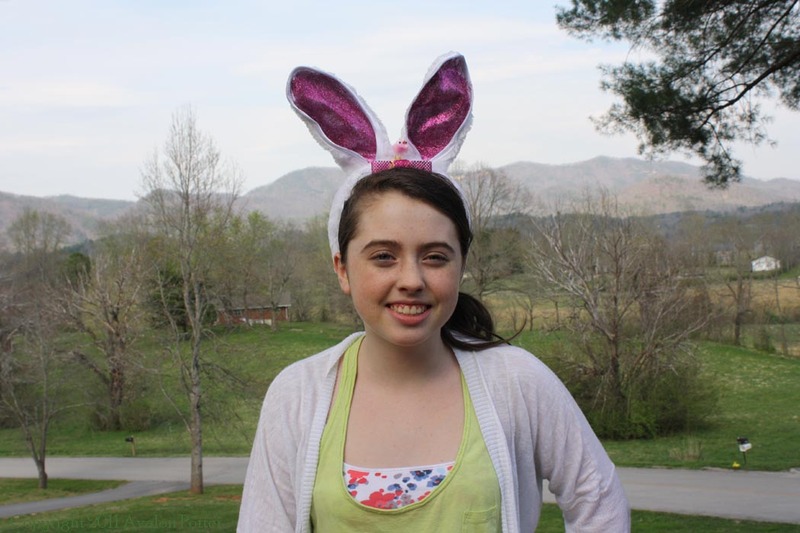 I was walking through a store when I saw this adorable Easter bunny ear headband! I took it home and after I tried it on I felt it was lacking...something. So what did I do next? I headed straight to my Tulip® bins to dig up some pink glitter and Tacky Glue! 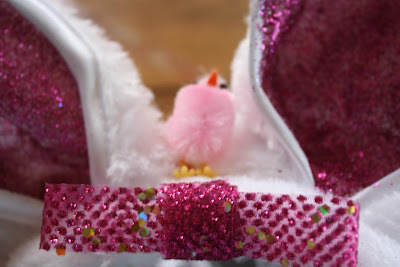 Next I looked through my ribbons gathering up some that matched the sparkles, and then I grabbed some tiny pink chicks. 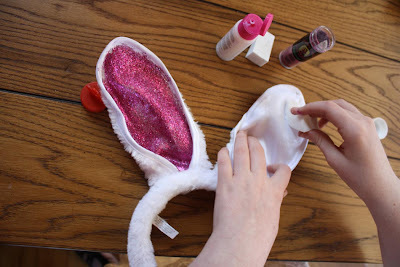 Finally I was ready to make some super cute pink Easter bunny ears! 1. Gather your materials and place newspapers around your workspace. Take Tulip® Fashion Glitter Bond™ and apply a thin layer inside of the ears. 2. Take your Frida's Fuchsia Crafty Chica® Chunky Glitters™ (if pink isn’t your color just use a different one from the various assortment) and sprinkle over the glue then shake it around making sure everything is covered. Shake off excess glitter and put back in container. 3. Let the glitter/glue dry for two hours. While you are waiting start on your bow. 4. Decide how big you want the bow loops to be and cut a piece of ribbon in the desired length. Place a small amount of Aleene’s® Quick Dry Tacky Glue™ in the center and fold in the ribbon ends. 5. Add another dab of glue in the center of the bow. Cut a small piece of ribbon just long enough to go around the middle of the bow. 6. Fasten the small ribbon around width of your first ribbon forming a bow and secure with a small dab of glue. 7. Use the Tacky Glue to attach the ribbon in the middle of the two ears directly in front and let dry. 8. Take the little chick and glue it on top of the headband positioned in the very middle. Allow to dry before wearing, even though you know you’ll want to wear it them right away! I have to do this with my little girl! This post is awesome except that I'm sure girls of all ages would love doing this...not just teens!